Commentators have hemmed and hawed about whose belly this is discussing. Some say it references Jesus on the cross after He gives up the ghost and the Roman soldier pierces His side. A mixture of water and blood comes out. This would make this a metaphorical reference to the confirmation of death at the crucifixion. The word “belly” is troublesome though because it means the lower abdomen, the lower belly. Jesus was pierced through the ribs. This would make this reference about Jesus and about the living water He gives. The problem is that this living water is the Holy Spirit (John 7:39). Granted, the Holy Spirit is sent by Jesus, by the Father and to testify of Jesus (direct affront to Holy Spirit centered worship and ministry). This might not seem too bad, but it stretches the more natural reading of the associated passages and the history recorded in John 4 about the woman at the well. If we put together the reading of John 4 and the reading of John 7 we find something very exciting. First Jesus shows us, then Jesus tells us. Jesus gave the woman at the well living water, salvation through faith in Christ. She shared that living water with the town’s men who came to Jesus. Then the whole town, as the men took Jesus and the disciples into Sychar, received the living water of Jesus (John 4:39). This presents a problem, the Holy Spirit had not yet been dispatched. Once again, what does the scripture say? John 4:14 reads, “shall be in him a well of water.” John 7:38 reads, “out of his belly shall flow.” Both passages are talking about the individual who believes in Christ, drinks in His living water WILL (future) share it. The message is clear, once Jesus sends the Holy Spirit of God to comfort in His absence, that spirit indwells the believer and will spring forth as a well of living water (John 4:14; 7:38; 14:17; 15:26). 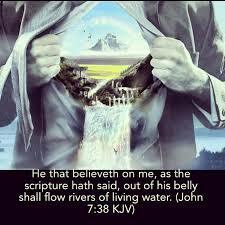 The Spirit of God, truth, will live within the believer and gush out of him. Clearly, believers pour out God’s spirit of truth upon the world. This is our testimony in His Spirit and another reason to celebrate the light of God’s grace.